Only a few days to go and the UEM European championship is finally kicking off. It has been a long wait because the Hungary race was taken off the calendar for 2012. The UK round at Santa Pod's Main Event, that is traditional held during the May bank holiday weekend, is also taking place one week later because of the Queen's Diamond jubilee. The Zodiac racing team is all excited to go out for this first UEM race of the season and are more prepared than ever. As usual we went testing during the Easter Thunderball, as Ton and Vincent Pels had some new parts to try out in the fuel and oiling system and because the team's new rider Job Heezen needed some seat time to get familiar with the supercharged Nitro Harley. The test weekend had some real highs and lows. One of the lows was definitely the temperature. With 7 degrees Celsius (45 degrees Fahrenheit) during the day and around freezing at night, it was definitely a cold Easter weekend. We were surprised to still see big crowds on the banking during qualifying and it is the proof that the UK drag racing fans are definitely the most loyal fans in the world! Another low was the data-logger that failed after the first the warm-up and this made us somewhat blind in the tuning department. With a new type of DJE fuel pressure regulator that needed to be set and some changes in the oil system, we needed to find a baseline and at those moments you discover how dependent we have become of those loggers. Everything from clutch to ignition is controlled by computers these days and without the logger you notice how close these engines are running on the borderline with modern systems. A definite high was the first day of qualifying. During the first run, the bike had massive shake from the line and smoked the tire after 100ft. So, contrary to chief starter Ian Marshall's advice (wink), for the second qualifier we took out some ignition and clutch during the first 3 second of the run to make it launch softer, and again after a serious tire shake (OK Ian, you might have been right with this one), the bike hooked up and ran quicker than ever before with a 6.51 and 211MPH. Job was immediately impressed by the amount of muscle the blower bike showed and he also ran a personal best by a full tenth of a second. Another thing that impressed him how much more weight he had to put into correcting this bike. "When you want to go somewhere, you better know in advance! Definitely different then the normally aspirated Nitro Harley I ran last year!" A puff of smoke at the top-end already showed that the engine did not survive the run and back at the pits it turned out that the engine had experienced some detonation and the deck of the front piston had collapsed. We were close, but were a little too much on the lean side. With the thick 70 weight oil we were testing, the plain rod bearings seemed to work good, but the main crank bearings which are of the cylindrical roller type, could not spin those high RPMs anymore and broke. The cold temperature, making the oil even thicker, might have been a contributing factor. Sadly the rain came in on race day, so that was it. But at least we know where we are and with these kind of numbers under these conditions, we think the competition knows we mean business. For the Main Event everything is ready and after consulting with Spectro Oils, we are going to try their Platinum 20W50 for the Main Event. A nice feature is that for this year, the European championship races will be televised live in High Definition on the Internet. 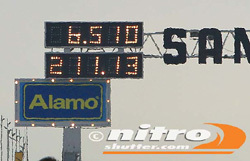 For more information about this, please stay tuned at www.eurodragster.com as they will give more details about the live Web TV shows. Last year we were very close with a 2nd spot in the championship when Roel Koedam was in the saddle. With the experience from last year we know the bike is ready and Job is confident he is up to the task of piloting the Godfather VII to the winners circle. Twenty-twelve, here we come! Photos courtesy of Ivan Sansom and Rose Hughes. The Zodiac SuperTwin Top Fuel drag racing team is proud to use products from Zodiac International B.V., Supertrapp Exhaust Systems, ACCEL Motorcycle Products, Spectro Oils of America, Kibblewhite Precision Machining, National Cycle Windshields, Goodridge Fluid Transfer Systems and Flexion/Gates Belt Drive Systems. 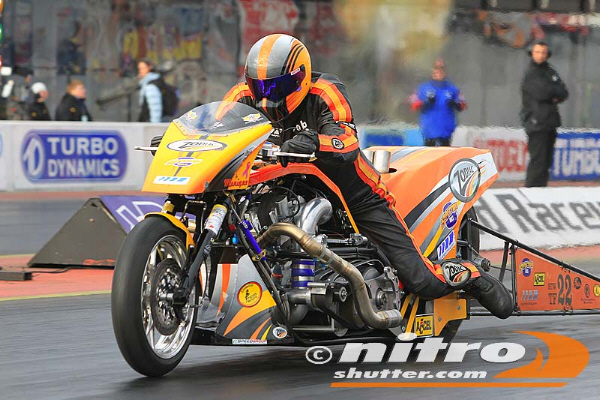 Job's bike, a 175CI (2860cc) OverKill T&V Racing Top Fuel Harley, is still for sale. So anybody that wants proven championship winning bike should contact him at jheezen1@hotmail.com or call him at + 31 6227 88100.